green inquiry | 2017/2018 – A Dream Reborn! This year, a new student (Aiden grade 10) decided to take over the garden. Over the summer the garden had gone into disrepair but I found potential waiting to be unlocked. So I requested if I could help run the garden as my IDS for this year. Once that was approved I started making plans. As I started looking into things I looked to see what supplies and seeds there were still from the previous gardening years. I found there was a small seed bank ( that needed to be organized) and a couple of shovels. I made a list of some supplies that we would likely need. The next part was to look at the garden itself. There are eight very large planters that were created five years ago; they still work but need some repairs and were overflowing with weeds. I began by cleaning the planters, which was quite difficult and Alex did some minor repairs on one of the planters. After I had my list I purchased some plants, as we were already in the fall. I also brought in some tomato plants that still survived from my Tomatosphere project that I kept going through the summer. I then began planting Fall veggies to create excitement and enthusiasm about the garden and what it could be. Due to the shape the garden was in, not many people were all that interested. And as Alan T. found out, doing this on your own is not easy. So I needed to gather interest, and fast. I started with plants like lettuce, tomatoes, and other easily recognizable common plants. Though I do want to try more interesting varieties, I needed to start with something simpler that would thrive in the fall and that people could recognize. Despite no longer being looked after as much, one plant was definitely still thriving – the rhubarb! In fact it had grown even larger than it ever was and it and a mint plant had taken over one planter. 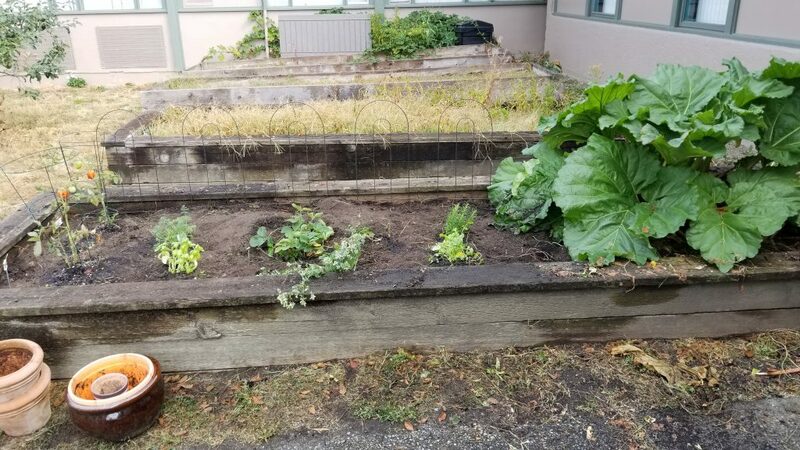 We decided to plant other herbs around it and have the rhubarb be the central piece of that planter. After my fall plants were in the garden I had to go to the next stage – plan ahead! Why did I need a plan? To get things done. To revive the garden, there are a few different stages and I’m sure many setbacks along the way we will have to overcome! First stage was to get the fall plans in – done! In this stage there were many hurdles that arose. I’d never written a grant, and though thankfully we had the assistance of other members of the garden club we simply didn’t have time to put it all together. We are postponing grant proposals until the spring or a later date, and working with what we already have. 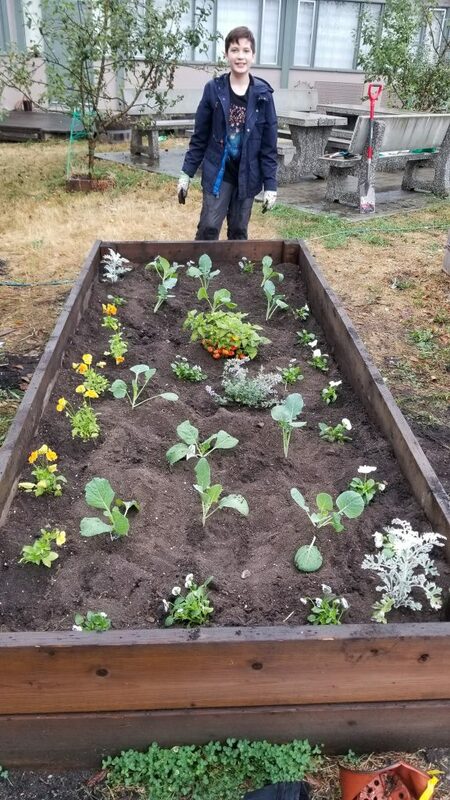 The second hurdle was was the weather…I had planted some fall vegetables, but around 2 weeks ago, a catastrophe happened-snow came unexpectedly. 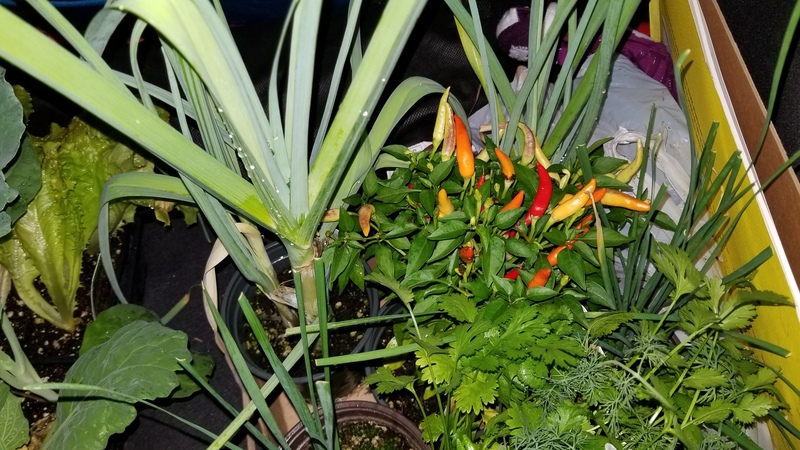 Many of my plants died in the sudden snow dump, but not all. My Cabbage, Broccoli, Brussels Sprouts, and a couple others managed to pull through. We have started looking into hoop houses or some other type of crop protection, and were able to salvage and harvest all our lettuce. Up until this point, however things were going pretty well! We had created Caesar salad, done many of the administrative tasks, and focused on the necessary things to keep the garden going. But the snowfall doesn’t mean we should give up. Nonetheless, we must move forward. Thus became my next step in the garden, as I began to look into Stage 3. For the Third Stage I started looking as to what other things needed to be planted or done before winter sets in. 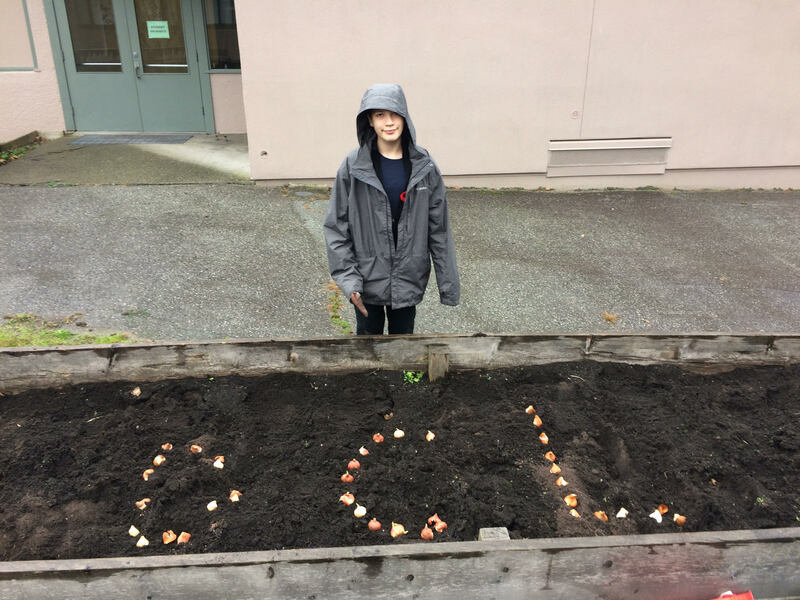 After looking through the West Coast Seeds Gardening Guide I noticed that spring bulbs needed to be in the ground asap – so over the Remembrance Day long weekend I got some and planted them. I created an arrangement of assorted flower bulbs (mostly Tulips, but also things like Daffodils) that make our catchphrase, DCL, Dream Create Learn. 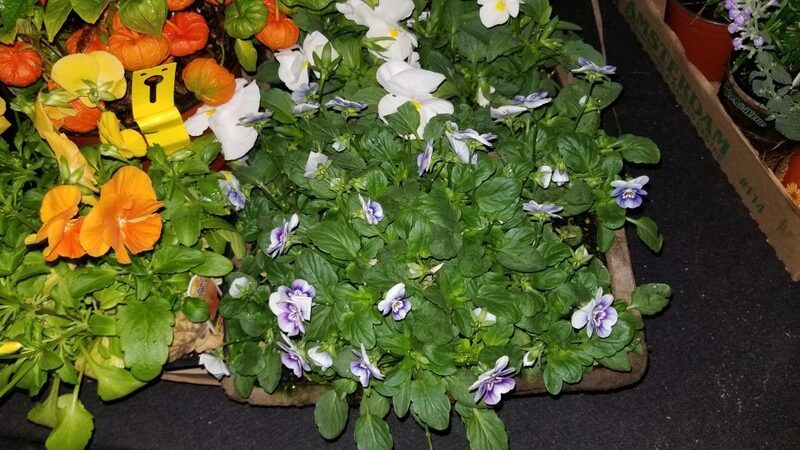 These particular flowers are interesting because you have to plant before winter, in order for the root structure to fully form, but they come up in April-May! Now they are all planted and ready to bloom.